The blacking process changes the colour of metal items to black, which improves the visual appearance, providing uniformity and consistency. The blacking process is a key part of Hepco Motion’s manufacturing process with all products apart from stainless steel or special orders being blackened. The dipping plant spans across 16 metres with 7 separate dipping tanks (4 tanks with chemicals and 3 clean water rinse tanks). The slides are held in a dipping module which can accommodate up to 16 x 4.32 metre lengths of slide at one time. The dipping module is then picked up by the gantry, moved forwards and then lowered into each of the 7 tanks in turn. 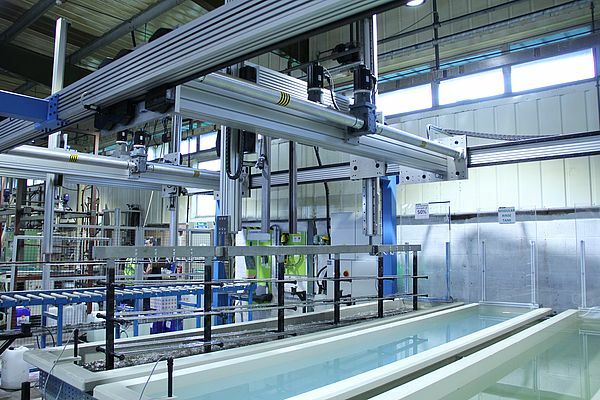 The gantry is constructed from HepcoMotion’s HDS2 heavy duty linear guides which has a wide range of V bearings and linear components to handle the heaviest loads. Hepco’s HDS2 gantry is ideally suited to this application as it is a high capacity system with low maintenance features. The X-axis comprises of 2 x HB25 aluminium beams at 16.16m long, each fitted with two single edge HD slides. V slides are used on one beam and flat tracks on the other beam, providing allowances for the variation in parallelism between the two beams. Parallelism of +/- 2.5mm ensures the set up time needed to accurately assemble the system is reduced. Moreover, the tolerance of misalignment ensures the system is able to cope with the offset loads. The slides are rack cut and fitted with MOD 3 rack option. 6 bearing carriages are used to accommodate the higher load. Moving at a nominal speed of 0.5m/s, the X-axis has been optimised to move at a steady and smooth speed to ensure the slides remain securely on the dipping module. The slides cannot be fastened to the module as this would cause non-blacked areas on the slide. HDS2 can move up to 4 m/s but this speed is not required for this application. With a payload of 700kg, HDS2 ESR slides (HS24ESRV) are used on the Z-axis, offering up to 4 times the load capacity of the standard HDS2 slide. ESR slides are precision machined from high quality steel and are surface hardened to provide high load capacity and wear resistance. Supplied with a MOD 5 rack, these slides have been designed to mount directly to Hepco’s range of HDS2 components, saving on valuable assembly time. The slides are mounted to a beam, housing the motors, gearboxes and drive shafts to provide the vertical and horizontal movement. The Z-axis moves at 0.5 m/s with a stroke length of 1.5 metres to raise and lower the slides into the dipping tank. Two heads are utilised to provide stability manoeuvring the 4 metre lengths; a challenging shape and size. The time spent in the tank varies from 30 seconds to 240 seconds, depending on the individual tank. 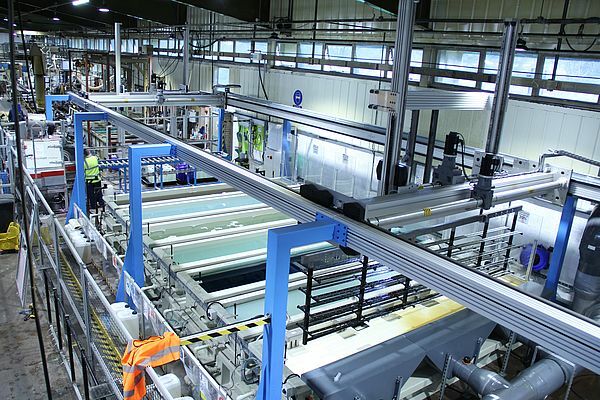 The previous linear system used by HepcoMotion worked by sending the slides on conveyors, with the chemicals sprayed onto the slides as they passed through different spray booths. The biggest problem with this system was the quality and inconsistency, as the surfaces of the finished slides were not consistently covered in the black colour. Moreover, a minimum of three people was required to operate the old system, whereas the new automated system requires only one person, resulting in a significant reduction in labour. Processing 0.9 metres of narrow section slide every minute, the new gantry system has improved both the quality and consistency of the finished product as well as reducing the number of operators needed.